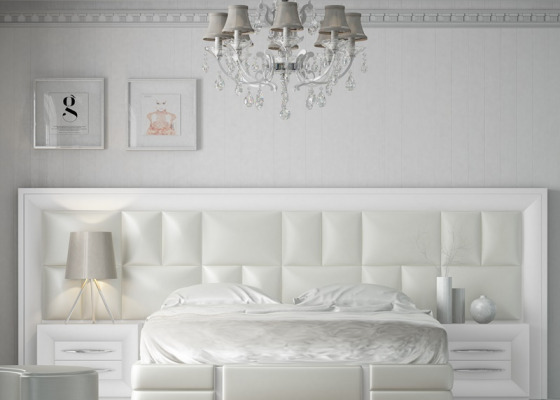 COMPLETE BED WITH HEADBOARD WITH OPTIONNAL LENGTH FROM 250 UP TO 350 CM WIDE x 10 DEEP x 150 HIGH CM. BED FRAME FOR 180x200 cm mattress: 193x205 wide + 10 cm for bed storage x 35 h. cm. BED FRAME FOR 135x200 cm mattress: 148x205 wide + 10 cm for bed storage x 35 h. cm. BED FRAME FOR 150x200 cm mattress: 163x205 wide + 10 cm for bed storage x 35 h. cm. BED FRAME FOR 160x200 cm mattress: 173x205 wide + 10 cm for bed storage x 35 h. cm. BED FRAME FOR 193x200 cm mattress: 206x205 wide + 10 cm for bed storage x 35 h. cm. 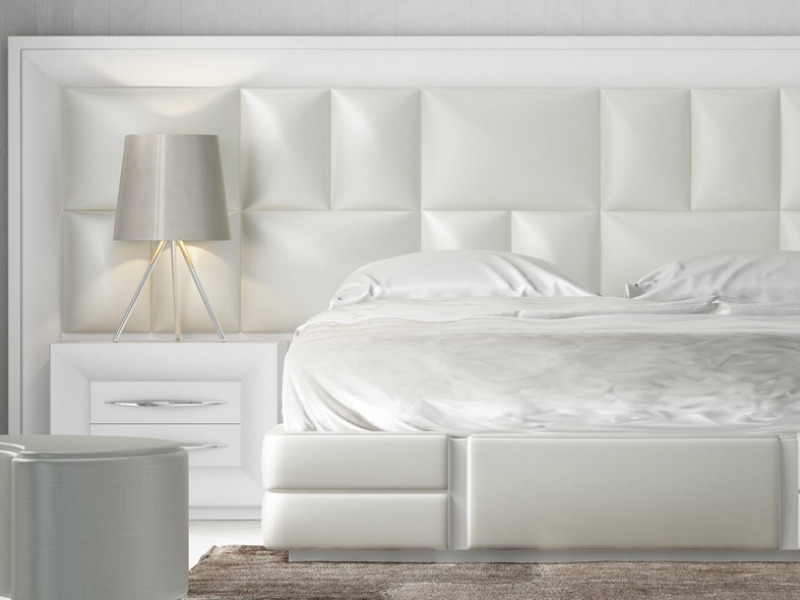 Large headboard with optionnal length between 250 and 350 cm. in matt lacquer with an elegant moulding 12,5 wide cm and upholstered central part. Possibility of perforating the socket-switch slot at no extra charge. Made of MDF fiber wood FIBRALAC specially designed to achieve the best possible finish when performing the process of lacquer and veneer natural oak wood dyed open pore. 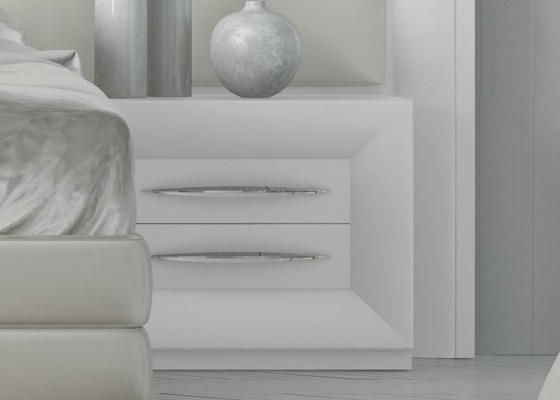 Check out our PDF of finishes where you will find a wide range of finishes and uphlstories. For a high gloss or oak finish, please report to the section "FINISHES" to get the corresponding price. Picture finishes: WHITE MATT LACQUER Nº 120 WITH STAR NUBE UPHOLSTERY FOR THE CENTRAL PART. 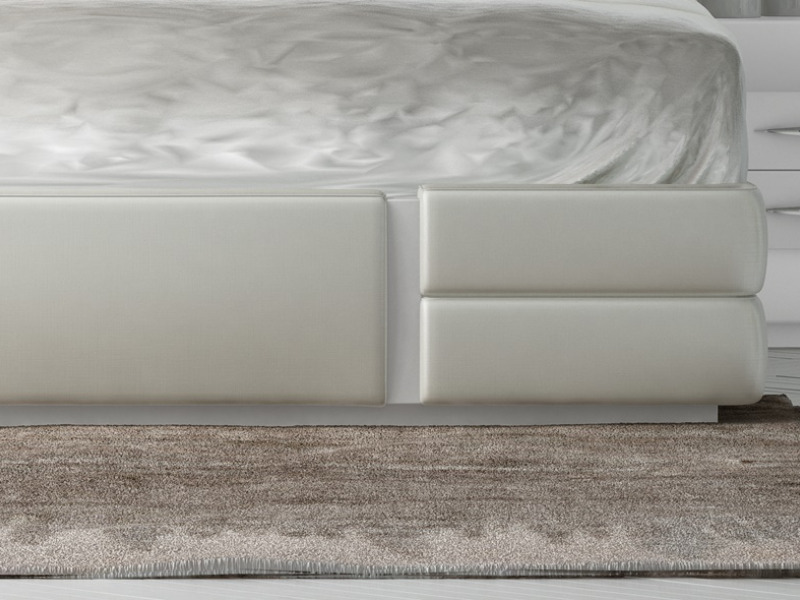 Bed frame in STAR NUBE UPHOLSTERY WITH WHITE MATT LACQUER Nº 120. Made of MDF fiber wood FIBRALAC AND handcraft upholstered. If instead of bed frame, you want a storage bed with upholstered base, see in our section "OPTION BED FRAMES" the price increase. ** MATTRESS NOT INCLUDED **.